Handful of change. 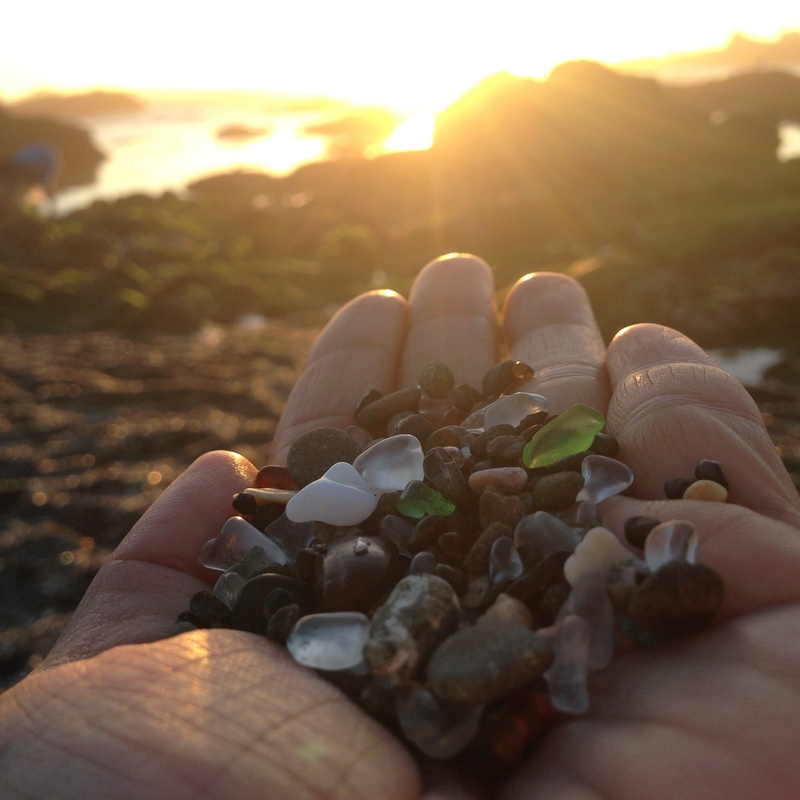 Fort Bragg’s Glass Beach in Mendocino, California. A week and a half ago, for the last moon day (a new moon, no less!) I was at Fort Bragg’s Glass Beach, pictured above. Here it glitters all golden as the afternoon sun reflects against glass pebbles of all hues, clear, white, green, amber, some blues. The beach was once a dumping ground for trash. It has long since been cleaned up, but what remains is this incredible beach of stunning sea glass, shards of glass bottles broken and rounded by water and waves. There’s no stopping change. This is actually a good thing. Because all of that terrible stuff, the events that we might freak out about, the things we think are such a waste, they transform too. What may seem like a loss, a tragedy, a mistake turns out to be a gift of immeasurable worth and beauty. In my own life, I suffer the most in the moments where I have resisted change. I create so much tension in my emotions and in my body. And everything has this “stuck” feeling. Eventually, I get tired, so tired that I relax enough to see that time, nature, the “nature” of nature, which is change, is moving in the same direction that I really want to go in anyway, only usually better, a lot better. How ironic it is that the thing which challenges us, that recognition of our own impermanence, is also what gives birth to so much possibility. And life is simply a journey in which we learn to trust in that. This entry was posted in Classes & Offerings and tagged Change, Impremanence, Life Practice, One Love, One Love Yoga, Trust, Yoga of Living by sisterhoodofthetravelingmala. Bookmark the permalink. Kate! Where are you now?